Not only do vigorous exercises burn more calories per minute than moderate activities such as walking and hiking, but fast-paced workouts such as running boost heart health and fitness with a smaller investment of time. Generally, you need 60 minutes of vigorous exercise a week to meet minimum physical activity recommendations. 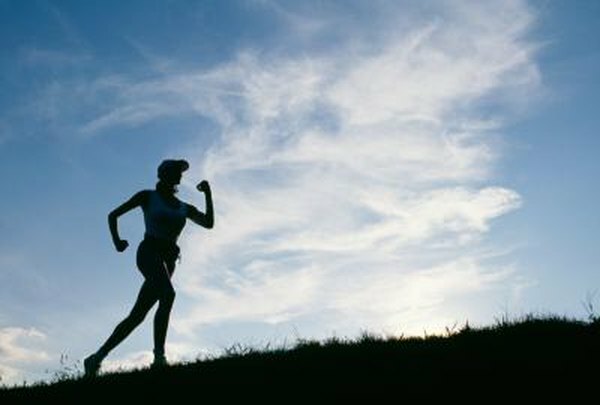 So, one run a day can improve your health while helping you lower your body weight. The amount of weight you can lose in a month depends on variables such as your diet and your current weight. If you're maintaining your body weight, your energy in and energy out is in balance, meaning that you burn roughly the same number of calories you consume. Adding runs to your routine should help you lose weight if you don't change your eating habits. However, if the number on your bathroom scale has been gradually rising, you need to reassess your diet and add exercise to your routine to produce weight loss. It takes a deficit of 3,500 calories to lose 1 lb. of body weight. Running at a pace of 5 mph burns around 117 calories, based on a body weight of 160 lbs. Energy expenditure per mile increases to 145 calories in an individual weighing 200 pounds. Running a daily 12-minute mile burns approximately 819 to 1,015 calories in a week, using the body weights listed in the examples. Refer to the physical activity calculator provided on the American Council on Exercise website to estimate calorie expenditure during runs based on your specific body weight. An increase in physical activity may be enough to produce gradual and moderate weight loss, as long as your caloric intake stays at maintenance level or below. To produce more substantial weight loss, set a lower calorie target. Going as few as 250 calories below weight maintenance needs produces roughly 2 lbs. of weight loss over the course of a month. Setting your target at 500 calories below maintenance level boosts weight loss by as much as 1 lb. per week. Running one mile a day leads to better cardiovascular and physical fitness and sets the tone for an overall healthier lifestyle. Make your hard work count by choosing healthy foods and beverages, limiting added sugar, sodium and saturated and trans fats in your diet. Choose lean protein options and emphasize fruits, vegetables, whole grains and low-fat dairy in your eating plan. Check with your doctor before starting a running regimen or changing your diet if you have a history of heart problems or specific dietary concerns.